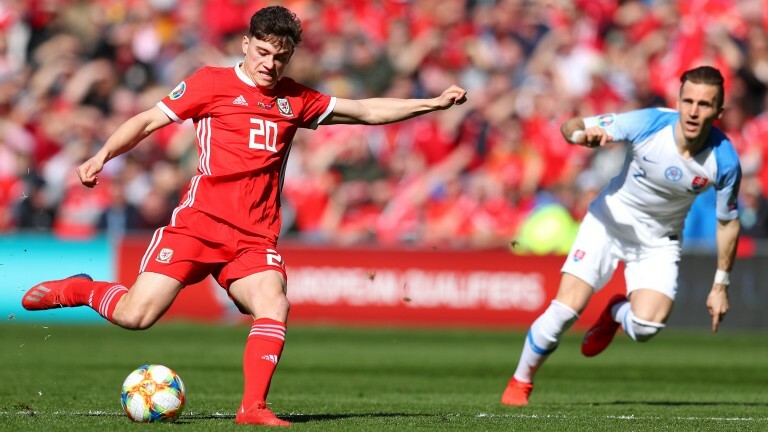 Wales are off and running in their quest to reach the Euro 2020 finals after Dan James's fifth-minute goal sealed a 1-0 success over Slovakia at the Cardiff City Stadium. Swansea speedster James – making his first start for the national team – lashed a stinging shot past Martin Dubravka before continuing to impress with his lightning pace and clever movement. Gareth Bale had a quiet game but a young and vibrant Welsh team were the better side for the opening hour and their goalkeeper Wayne Hennessey came to the rescue late on with a decent save from a near-post header from Slovakian substitute Michal Duris. There is huge potential for Wales to improve but they are still flying under the radar at 66-1 in the tournament betting. Wales have been cut from 4-1 to 11-4 to win Group E, while Slovakia have drifted from 7-1 to 10-1. Kazakhstan's flying start to Group I ground to a halt when they lost 4-0 to Russia in Astana. Denis Cheryshev's brace put Russia 2-0 up at the break and further gloss was added by Artem Dzyuba and an Absal Beysebekov own goal. Russia coped far better with their trip to Kazakhstan than Scotland, who lost 3-0 at the same venue on Thursday. But their impressive victory has not influenced the bookmakers, who are still offering 66-1 about a Russian triumph at Euro 2020.